Carl Zimmer has 1 media appearance. Carl Zimmer signs Science Ink: Tattoos of the Science Obsessed. Carl Zimmer reads from Microcosm: E. coli and the New Science of Life. • Within days of being born, we are infected with billions of E. coli. They will inhabit each and every one of us until we die. E. coli is notorious for making people gravely ill, but engineered strains of the bacteria save millions of lives each year. • Despite its microscopic size, it contains over four thousand genes that operate a staggeringly sophisticated network of millions of molecules. • Scientists are rebuilding E. coli from the ground up, redefining what it means to be alive. Carl Zimmer discusses Soul Made Flesh: The Discovery of the Brain—and How It Changed the World. Penrose Library, in association with the University of Denver Provost’s Office, cordially invites you to attend the Second Annual Penrose Library Author’s Lecture by acclaimed science writer Carl Zimmer, who will discuss his work, his writing process, and the art of writing about science. The program is free and open to DU students, faculty, staff and community members but reservations are required. Dessert refreshments will be served. 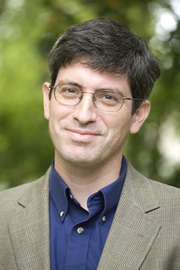 Carl Zimmer is a LibraryThing Author, an author who lists their personal library on LibraryThing. Carl Zimmer is currently considered a "single author." If one or more works are by a distinct, homonymous authors, go ahead and split the author. Carl Zimmer is composed of 3 names. You can examine and separate out names.